"I got this recipe from my mom. Has a great taste. It is very easy to make so the kids can enjoy cooking as well. Serve it as an appetizer for any party." Preheat oven to 375 degrees F (190 degrees C). Line a baking sheet with aluminum foil and spray with cooking spray. Stir chicken, cream cheese, and garlic powder together. 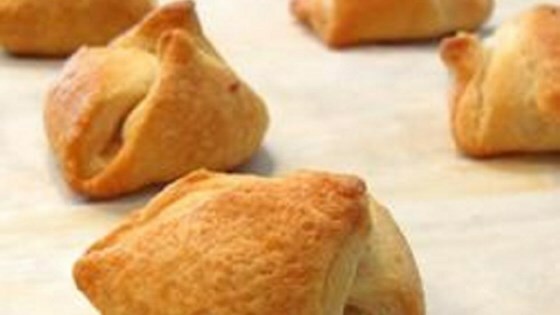 Unroll crescent rolls and cut each triangle in half into 2 triangles, for a total of 16 triangles. Lay triangles out on a flat work surface. Place 1 teaspoon of the chicken mixture in the center of each dough triangle and fold corners over the mixture into the center. Place folded dough pieces onto prepared baking sheet. Bake in the preheated oven until golden brown and puffed, 12 to 14 minutes; cool before serving. Crescent-wrapped cheesy chicken and spinach! very simple, quick thing to make. Our kids like them too! Made as is. Quick and delicious! Everyone who's tried it loves it!